During recent years, theatre in Turkey has been generally prosperous. Spectators can find various trends, theatrical forms, and new dramaturgical and narrative techniques during a season, especially if they attend works by the so-called “independent theatres.” Among the independent theatres, theatrical diversity story-telling, feminist dramaturgy, and re-writing and adapting (auto)biographies and classical texts are very common and popular. Another common subject is “otherness”: the situation of women, transgendered persons, homosexuals, and minorities such as Kurds and Armenians. BGST (Boğaziçi Gösteri Sanatları Topluluğu), one of the leading theatre groups in Istanbul that works on feminist dramaturgy and re-/de-construction of cultural history in theatre—such as producing metatheatrical and metahistorical texts—is an obvious example of such experimentation. They also have their own acting and narrative techniques which combine Stanislavski’s acting method with Brechtian dramaturgy. 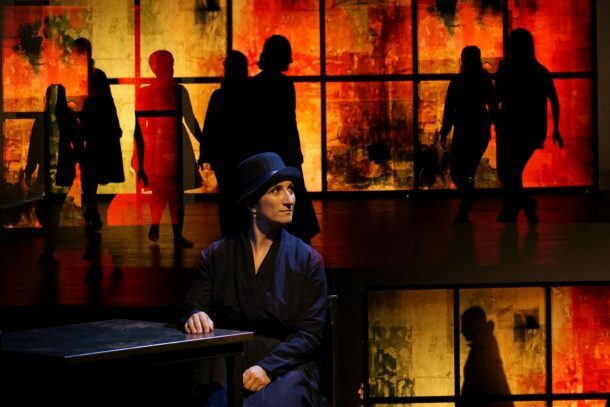 BGST’s most recent production is Zabel, which presents the life story of the first Armenian socialist-feminist woman writer Zabel Yesayan (1878-1943), who spent most of her lifes exiled from the Ottoman Empire to the Soviet Union. In this essay I will focus on the production Zabel, which was premiered in May 2017 and is being staged again during this year’s theatre season. It is a cowritten and codirected performance, as are the other collective productions by BGST. 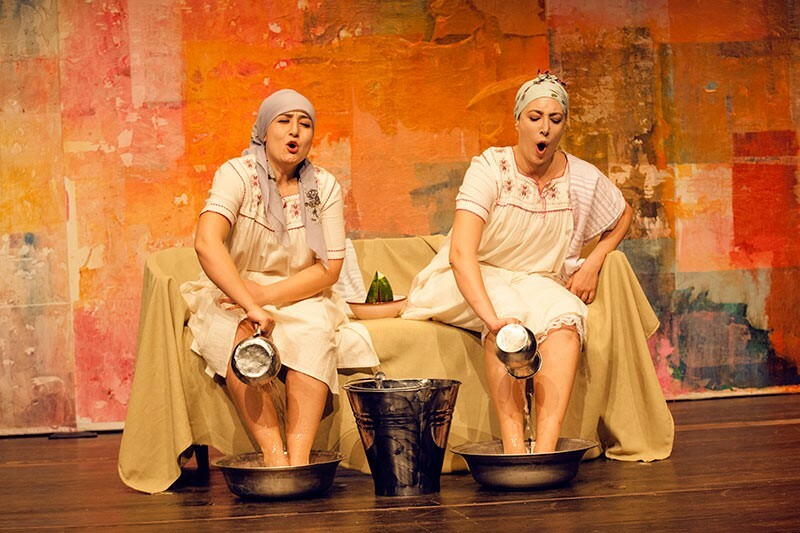 But this time, the text was written by Aysel Yıldırım and Duygu Dalyanoğlu, who are also the performers in Zabel. They underline the fact that all the participants researched, studied, and discussed together the life of Zabel Yesayan and her works and how to tell Zabel’s story to the audience. The spectators are given a chance to encounter not only a powerful and inspiring woman named Zabel in recent history, but also to learn about other women who touched her life and gave her the strength to stand. 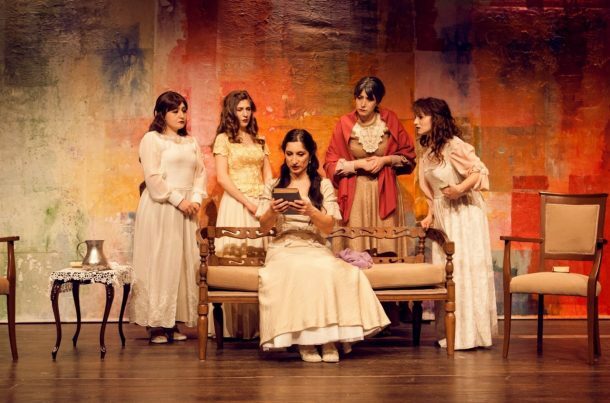 Zabel, written by Aysel Yıldırım and Duygu Dalyanoğlu, staged by BGST. Photo: Kenan Özcan. The drama both shapes and is shaped by the idea of women’s solidarity. To accomplish this, the group chooses to tell Zabel’s story through and with other women’s stories—ranging from Zabel’s mother, grandmother, aunt, and midwife to her favorite female novelist, Turkish friends, neighbors, students in the Sorbonne, and a nurse. Zabel has a dualistic structure. It begins with the title character being queried by a woman in her prison cell, beginning with the question “your name?” She answers “Zabel Yesayan.” From this first scene, the audience encounters a strong, experienced, intellectual, humanistic elderly woman named Zabel Yesayan. She is being held prisoner in Stalin’s Russia in the1940s because she is a Trotskyist and because she claimed her friend’s (a Trotskyist poet’s) dead body as Antigone did for her brother. In the first scene, Zabel is being queried. Duygu Dalyanoğlu and Aysel Yıldırm as Zabel Yesayan. Photo: Kenan Özcan. Thus in the first scene we are shown what happens at the end. This is not a chronological telling of Zabel’s life story, but a conjuring up of the past for the present. 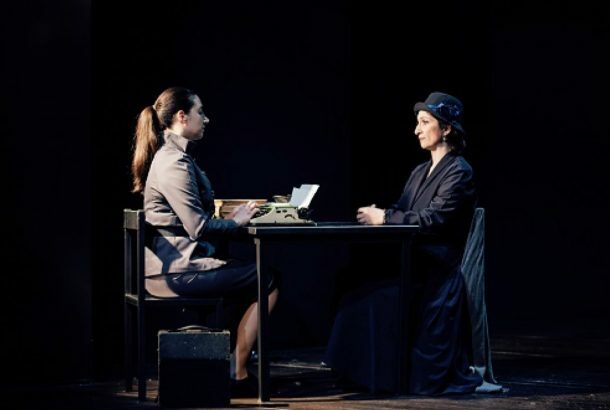 When Zabel is alone in the jail cell, after being questioned, she begins to read her own childhood memories from Silahtar Bahçeleri which she called “there, my paradise,” summoning up memories of her beginnings to the “here and now.” The dark, gloomy, and oppressive atmosphere of the stage becomes colorful and amusing through a plunge into her memories. As women of her family and childhood appear onstage, there also appears an inspirational and functional décor made by mixing papers and colors on the backdrop (designed by Dilek Şenyürek). Like the dualistic structure of the play, the décor presents the changing mode of Zabel’s life: on one hand her past, and on the other, her being queried in the present. The décor has different views and colors that change according to the lighting. It mirrors the women’s feelings and experiences, reflecting fear, excitement, pain, happiness, and sorrow, as well as representing the fluidity between past and present. It is also possible to see shadow plays on it during some scenes. The shadows refer to an uncanny outside for the women and to their becoming visible in the public space. Young Zabel with other women in her home. Photo: Kenan Özcan. When Zabel begins to remember, her mother appears in her cell. She holds Zabel’s hand and takes her to the center of the stage, to the space of a new play, “the play of her memory.” The other temporal structure of the play begins by the actresses moving away the stage props, such as chairs, costumes, tables, buckets which are put on the right side. In contrast to the “real” and first temporal structure of the performance, this other one includes hopeful, funny, tragicomic, and affective scenes as does life itself. We are shown Zabel’s birth, her childhood, her first love, her meeting with her favorite feminist writer, her becoming a mother, and her opening of an Armenian orphanage in Adana and struggling both with the poor conditions in the orphanage and the ideological pressures of the Ottoman government in the city. This past narrative is interrupted with irritating sounds such as knocking at the cell’s door in the prison which signals dinner time or the arrival of the interrogator. Often, as she remembers or puts in other words the problems or pressures of the past such as being an Armenian or the consequences of the world war, she is awakened by these threatening sounds. What is remarkable in this performance is how it presents the past not simply as a beautiful shelter or as a source of happiness. Rather, during the performance, we see Zabel trying to relive her memories because she wants to forget her existence in the prison and overcome her present situation. Each scene is constructed in a way that highlights the relationship between women from different nations and social positions. It becomes clear that what makes her “Zabel Yesayan” is the women in her past. 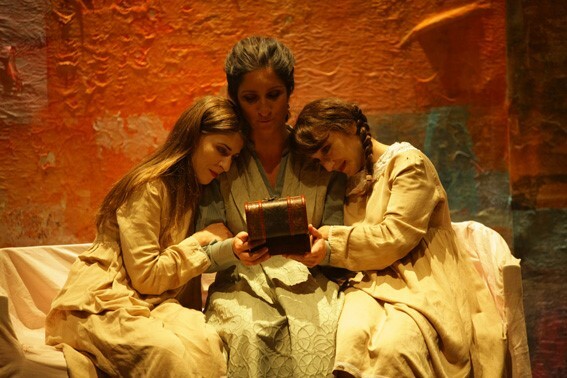 The scenes that show the “plays of her memory” unfold the condition of women in the Ottoman period, both Armenian and Turkish, and make us feel that what women share in common is not only in the past but also today. BGST’s feminist dramaturgy admirably presents women’s solidarity in each scene regardless of their different experiences. The most affecting scene takes place in the hospital, showing what happened to Zabel on that infamous day, 24 April 1915. As we know, she was the only woman whose name was written on the list of runaways. But what really happened on that day? We do not know how she avoided being caught or how she escaped from the city. In the performance, they showed an impressive and funny scene instead of showing how people suffered through exile and death. Zabel hides in a hospital and enters a room where a woman with a newborn child is sleeping. We learn something is wrong with her baby. Although the nurse and young woman are also Turks, they do not know Zabel. Yet they realize that she is wanted by the authorities, and they hide her away, not only because Zabel saves the baby’s life, but, also because they are women showing sympathy for each other. In the final scene, we see Zabel at her table in the prison cell, putting together a farewell address to her graduate students in Paris, in which she quotes from Antigone’s last speech in the prison. With particular reference to Antigone both at the beginning and at the end of the performance, it becomes a “haunted stage” to borrow a phrase from Marvin Carlson. This underlines the circumstances that Zabel and Antigone have in common: living in a society that cannot bury its own dead. Zabel does not reveal the actual tragic story of what happened on the 24th of April, rather it makes us feel the consequences of what has happened in the past. This is at the heart of why I described the performance as both a theatrical and real encounter with Zabel Yesayan. In Turkey, for the man in the street, it is hard to share an experience or to identify himself with the “other,” especially with an Armenian woman. In this regard, BGST’s Zabel takes risks. But it inspires hope to witness that spectators respond to the performance in the way they were expected to. We may, of course, read the entire play as an answer to the question of “What’s your name?” at the beginning of the performance. To respond as “Zabel Yesayan” means to perform what makes her “Zabel Yesayan,” to show the circumstances under which she became a public figure and to reveal what lies at the heart of her name: the power of women’s solidarity in a conflicted society. Eylem Ejder is a Ph.D. candidate in the Department of Theatre at Ankara University, Turkey. She is a member of International Association of Theatre Critics – Turkey Section and the assistant editor of the IATC-Turkey’s quarterly theatre journal Oyun (Play). She is currently writing her dissertation, entitled “Narratives of Experience: Monodrama in the Post-2000s Turkish Theatre.” Her Ph.D. studies are being supported by The Scientific and Technological Research Council of Turkey (TUBITAK) within the National Ph.D. Fellowship Program.